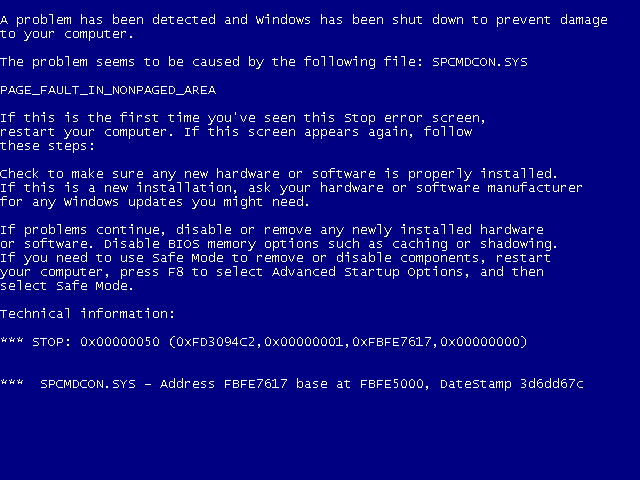 The dreaded Blue Screen of Death (BSOD) has existed at least as long as Windows, and baffles even fairly advanced computer users. It is usually triggered by low-level errors in the CPU, which in turn are usually caused by driver problems (e.g. illegal pointer references and such) or hardware problems (e.g. deffective RAM or CPU overheating). Usually the errors listed are not very descriptive, just one of the problems in actually making use of them. Whenever I've begun experience frequent BSODs, I've always just formatted my computer and reinstalled Windows, thinking that whatever is happening is probably a software or driver issue so obscure I'd never track it down. However, during the most recent outburst of BSODs on my new laptop (a 10 month old Dell), I decided to take a serious crack at analyzing the BSOD details.